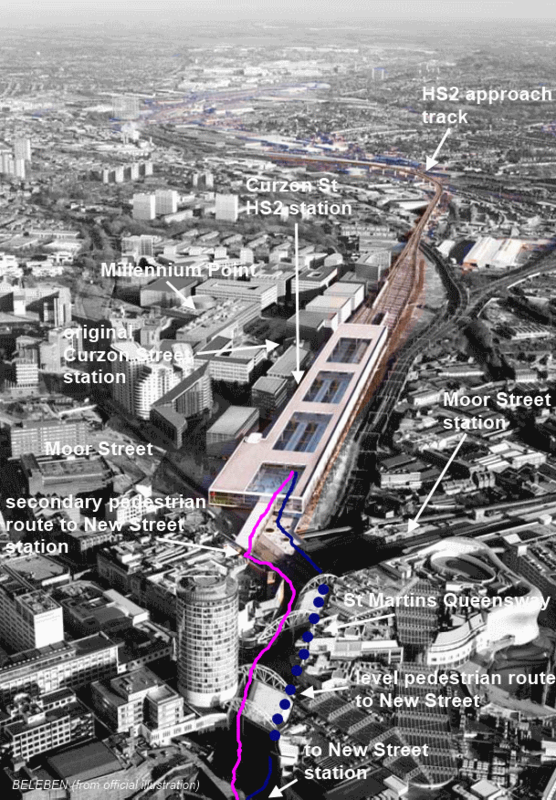 Previous posts on this blog have signalled the disconnectivity and inconvenience built into the Birmingham HS2 terminal arrangements. The recently released HS2 Ltd bird’s eye impression of Curzon Street from above, gives a new angle on these shortcomings. The station is also revealed as a charmless steel box – a throwback to the failed reinvention of the city centre in the 1960s. On April 21, the Birmingham Post reported that “the 1838-built Grade I-listed frontage of Curzon Street station would be “the main entrance” to the Curzon Street HS2 terminal (and gave a different artist’s impression of the terminal, by Glenn Howells architects). However, the HS2 Ltd artist’s impression suggests that the Cumbernauld style entrance over Moor Street would be the principal access. The 1838 Curzon Street building is lost alongside, and overshadowed by, the massive steel box of the terminal platforms. Because of the £17 billion cost, it’s almost inevitable that the air rights above the platforms would be sold, but that doesn’t figure in either view. In Birmingham, exploitation of air rights took place at both New Street and Snow Hill stations, and the consequences of this are abundantly clear to anyone who has set foot in them. Westbourne Communication, an ‘opinion changing’ PR firm supporting (new build) high speed rail, posted on the power of third party endorsers. The idea behind it is that if something said by person ‘A’ is backed by third parties ‘B’ and ‘C’, its trustworthiness or validity is raised. 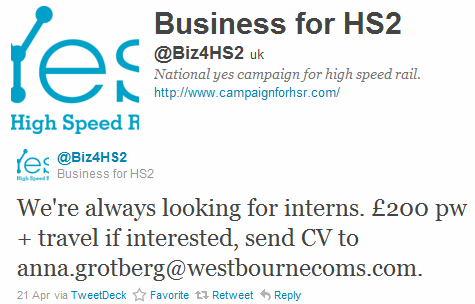 This goes some way towards explaining the phenomenon of multiple separate PR campaigns for HS2. In the West Midlands alone, Birmingham City Council, Centro, High Speed 2 West Midlands, and Go-HS2 have all undertaken support activity for it. But these activities are not ‘grassroots’ campaigns, nor are they independent of one another. It’s a form of shilling, with the targets of this PR activity unlikely be to be aware of the links between the organisations orchestrating it. seeking funds to counter opponents of the £17bn project to build an ultra-fast rail line between London and Birmingham, warning that the naysayers have a £1m war chest. Professor David Begg, former chairman of engineering firm Tube Lines and non-executive director of airport group BAA, launched the organisation last month following a dinner attended by the transport secretary, Philip Hammond, and senior transport industry figures. In an email to attendees, Professor Begg asked each company that joins the not-for-profit body to contribute £10,000, alleging that the project’s “vociferous” opponents have amassed a £1m fund. It is understood that major public transport groups with UK operations have been contacted as part of the fundraising drive. It seems odd for Mr Begg to be denigrating opponents of HS2 ‘as rich Nimbys with a £1 million war chest’, while running a campaign that’s looking for £10,000 contributions from businesses, and operated with professional PR support. Generally, businesses are looking for a return on their investment, yet at the time of writing, the Campaign’s website gives very little information about how it is run, and how supporter-contributors influence it. The only “real people” involved seem to be interns looking for an entree into the world of public relations. There are at least some transparency rules in place regulating donations to, and operations of, British political parties. So it’s anomalous that the workings and influence levers of politically controversial corporately funded campaigns, remain completely invisible. In January I looked at the practice of high speed rail operators in Europe charging premium rates for travel, and contrasted this with Greengauge 21‘s pronouncements about ticket pricing on HS2 (“there will be not be premium fares”). In general, fares on very high speed trains should be higher than conventional ones, because of the increased costs involved, and the higher externalities. It follows that if users of very high speed trains are charged the same as users of conventional trains – when the costs of these services are very different – there must be additional subsidies allocated to the high speed rail users. So in practice, “no-premium-fares-on-HS2” means users of conventional trains subsidising the consumption of high speed travellers, through higher fares. A sort of ‘Robin Hood in reverse’ situation. The spin machines for HS2 has already produced some wacko press releases. The following one, dated April 16, 2011, comes from David Begg’s Campaign for High Speed Rail (note that the point numbering in the original version was broken). Today, Manchester United are playing Manchester City in the FA Cup semi-final at London’s Wembley stadium. The stadium has a capacity of 90,000 – an estimated 60,000 of these will be filled by fans travelling down from Manchester, the hometown of both football clubs (1). There are currently 3 trains per hour between Manchester and London, with each train having the capacity to seat 439 passengers. This means that the WCML can carry 1,317 passengers per hour from Manchester and London (3). During the key period in which supporters will be hoping to travel tomorrow morning, only around 6,585 passengers will be able to be transported (4). With a dedicated line for high-speed travel from Manchester, there will be network capacity for up to 3 trains an hour to London (4 at peak time), each carrying up to 1,100 passengers (5). In addition, there will also be trains running from Manchester on the existing WCML – modest estimates suggest there would be capacity for 2 trains per hour on this line carrying 595 passengers (6). In total, estimates therefore suggest an increased capacity of 4,490 passengers per hour (off peak) and 5,590 (peak) from Manchester to London. During the morning period in which supporters will travel today, nearly 22,450 passengers would be accommodated if we had a high-speed service. If this was a peak time service, there would be around 27,950 seats. This is over three to four times more than the current numbers. Although some charter trains would still be required, a high-speed line would substantially relieve road and air travel to the football match by providing passengers with a much higher number of seats on the rail network. A high-speed line would also ensure that, despite a surge in long-distance passengers, far fewer local commuters would be affected because the majority of passengers would be travelling on the dedicated high-speed line. “The crowding at 5pm in Euston station is reminiscent of scenes in Bombay. Passenger demand on the line has doubled in the last six years, and it is clear that serious investment is needed in order to meet these figures. (2) Tomorrow’s game is only one example of a time when the demand on the WCML is heavily over its capacity. It is also heavily over-subscribed during peak times and Bank Holidays. Over the past six years, passenger demand on the line has doubled and has now reached 28 million per year http://mediaroom.virgintrains.co.uk/2011_02_01_archive.html. (3) These trains run at 15, 35 and 55 minutes past the hour on weekdays and weekends. We have estimated that the key period tomorrow morning will be trains leaving Manchester between 08:00 and 13:00 in order that supporters get into London in time for 17:15 kick off. (4) This is once the whole ‘Y’ network has been completed, and hence high-speed tracks run all the way up to Manchester. There would also be an additional train at peak time, carrying an extra 1,100 passengers. See Department for Transport, Economic Case for HS2: the Y network and London – West Midlands, p.61, http://highspeedrail.dft.gov.uk/sites/highspeedrail.dft.gov.uk/files/hs2-economic-case.pdf. (5) These figures are based on a proposed rescheduled timetable, once a dedicated high-speed line has relieved capacity on the existing network. For example, see Greengauge 21, HS2: Capturing the Benefits of HS2 on Existing Lines, February 2011, http://www.greengauge21.net/wp-content/uploads/Capturing-the-benefits-update.pdf. (7) Virgin have already made an announcement about travel arrangements for this weekend, and has promised the use of charter trains to help relieve the pressure. The press release is available here: http://mediaroom.virgintrains.co.uk/2011/03/fa-cup-semi-finals-at-wembley.html. (8) The Campaign for High Speed Rail represents employers from across the country who believe Britain needs a modern, high-speed rail network to meet the challenges of the 21st Century. Our case is backed by business people from across the country. Some of these business people employ large numbers of people, some employ just a handful. We are united by a belief that high-speed rail will significantly help Britain’s economy, creating jobs and boosting parts of the country that need it, particularly in the Midlands and the North. We also believe that it will make ordinary passengers’ lives easier by freeing up capacity on existing lines, bringing better services to more people. (9) You can learn more about the campaign on our website: http://www.campaignforhsr.com. (10) For more information please call Lucy or Anna on 07758 019 351 or info@campaignforhsr.com. the numbers travelling are not easily accommodated by rail. But dimensioning rail capacity around infrequent or one-off events is not rational. Transport projects need to be designed with regard to common sense. Over-dimensioning capacity provision is the economics of the madhouse. Unlike a reactivation of the line through the Peak District, the £17 billion HS2 phase one would not provide any noticeable rail capacity uplift between Manchester and London. So chartered coaches, and cars, would be just as important as they are today. Begging the question: what is Yes to High Speed Rail for? a campaign, independent from the Government and HS2 Ltd, representing employers from across the country who believe Britain needs a modern, high speed rail network to meet the challenges of the 21st Century. Our case is backed by business people from across the country. Some of these business people employ large numbers of people, some employ just a handful. Internationally, the most successful high speed lines have been between cities at similar distances to those the UK is facing, such as the Paris-Lyon line in France and the Frankfurt-Cologne line in Germany. The latter is around 110 miles, the same distance that separates London and Birmingham. Rail companies have been asked to contribute £10,000 each to a High Speed Two campaign group which has been launched to fight back against a growing anti-HS2 movement. Professor David Begg, former chairman of engineering firm Tube Lines and non-executive director of airport group BAA, launched the organisation last month following a dinner attended by the transport secretary, Philip Hammond, and senior transport industry figures. Yes to High Speed Rail and Greengauge 21 are both engaged in campaigning for HS2 to be built, and their positions on a national high speed rail network appear to be extremely similar, if not identical. So why set up another separate operation? Both campaigns were founded by chiefs of abortive Labour transport quangos after they were wound up (Jim Steer at the Strategic Rail Authority, David Begg at the Commission for Integrated Transport). So it may be a personality thing, with Professor Begg not wanting to play second fiddle to Jim Steer. But because the SRA was wound up and Greengauge 21 set up in 2005/2006, Professor Begg’s outfit is very late to the funding party. The early bird catches the public sector worm. 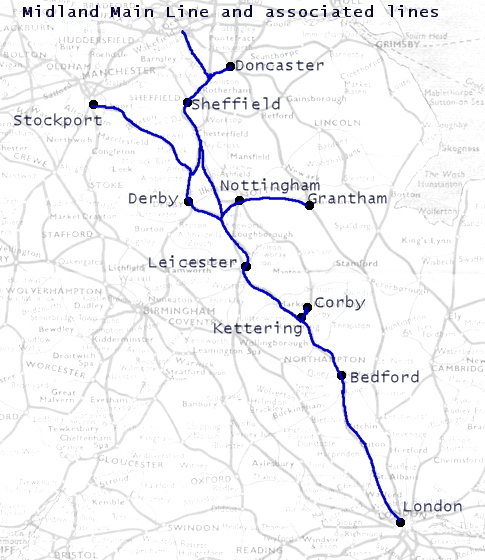 The Midland Main Line is the principal railway connecting London’s St Pancras station, the East Midlands, and South Yorkshire. The portion between Bedford and London, electrified in the early 1980s, has significant commuter traffic to and from the capital, with Thameslink trains continuing via Blackfriars to destinations south of the Thames, including Brighton. Although most long distance trains are operated by Bombardier Meridian and InterCity 125 formations, extensive use of 125mph (200 km/h) appears more of a Network Rail aspiration than a reality, although that linespeed is mentioned as existing in Network Rail’s Route Utilisation Strategy. Investment in the MML has not matched levels seen on the West Coast or East Coast Main Lines, and decisions on electrification of the main line proper (i.e., beyond Bedford) have been placed on the back burner. Since 2008, the prospects for significant upgrading of the MML appear to have receded, due to the state of the public finances, and politicians’ seeming overnight conversion to new-build high speed rail. The £17+ billion High Speed 2 line has been at the forefront of government transport policy, with investment in MML almost nowhere to be seen. In its response to the government’s consultation on HS2, high speed rail lobbyist Greengauge 21 has backed a link from HS2WM near Birmingham to the existing cross-country line to East Midlands and South Yorkshire, although there’s no detail given as to how this would work. According to HS2 Ltd, the new-build Coleshill to Euston trunk would carry 14 trains per hour in each direction, without any paths allocated to London – Derby/Nottingham/Sheffield traffic. Besides, routeing such trains over HS2 would make no sense in carbon emissions, Greengauge 21 provides no usage projections, and no-one seems to know where the East Midlands station would be. I suppose if you’re blindly devoted to an idea, details like these don’t matter. In commissioned work for the Department for Transport, W S Atkins have presented MML electrification as part of a package of measures for comparison against HS2. The order of events following the Labour government’s conversion to new build high speed rail was: (#1) set up the HS2 project and HS2 Ltd, then (#2) commission some reports showing that (#1) is the correct course of action. In essence, Atkins were tasked with demonstrating the inferiority of upgrading MML and other lines, compared with Adonis/Steer. One of MML’s advantages is the existence of stations close to Derby, Leicester, and Nottingham city centres. Yet, as demonstrated by the vacillation that preceded the announcement on Great Western electrification beyond Didcot to South Wales (and its truncation at Cardiff), prospects for significant development of the MML appear to be darkening, in the face of political fascination with the grand projet, in the form of Adonis/Steer high speed rail (and its parkway stations remote from city centres). Because the Midland Main Line has a fair amount of spare capacity, it could be used to augment the range of services between the northern England and London, at a far lower cost than £33+ billion involved in building HS2 to Manchester and Leeds. In the 1960s, the Midland Main Line was used by fast trains running between Manchester and London, travelling through the picturesque Peak District (also providing Manchester with a direct link to Derby and Leicester). Following the electrification of the West Coast Main Line, the St Pancras – East Midlands – Manchester services were discontinued, and the line north of Matlock was closed down. Although the original Mancunian terminus for the MML, Manchester Central, has long been re-purposed, it would still be possible to recreate a Manchester to St Pancras train service, and give the East Midlands a credible rail connection into the North West. The route through the Peak District is essentially intact, and (part) used by Peak Rail’s heritage trains. Given the political will, electrification of the MML could be implemented at relatively low cost, especially if existing rolling stock were re-used as part of the process. Provision of a pantograph car for the Bombardier (currently diesel) rolling stock has already been discussed. It’s also known that large numbers of InterCity 125 carriages are fit for modernisation (i.e., power doors, retention toilets, additional facilities for disabled people). New electric locomotives combined with rakes of remanufactured Mark 3 carriages, could be part of the environment-friendly alternative to the run down, diesel operated MML future offered up by HS2.